March 21st, 2016 | News and Events, Wheaton World Wide Moving. Direct Lease Driver of the Month, Mark Jacks, Tipton, Ind., has 33 years of experience as a household goods driver. He maintains a top driver performance rating. This is Mark’s first Driver of the Month award. 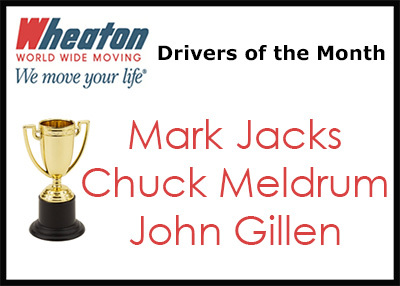 Chuck Meldrum, Preferred Moving Systems, Harrison Township, Mich., earned Wheaton’s Permanent Fleet Driver of the Month award. Chuck has more than 16 years of experience as a professional household goods driver. This is his sixth Driver of the Month award. Chuck was also selected as Driver of the Year in 2009. John Gillen, Coast to Coast Moving & Storage, Key West, Fla., earned Wheaton’s Intermittent Fleet Driver of the Month award. John has 26 years of experience as a professional mover and this is his second Driver of the Month award.